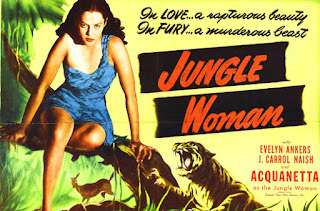 A year after 1943’s Captive Wild Woman, Universal attempted to turn the lively if laughable film into a viable B-movie franchise. 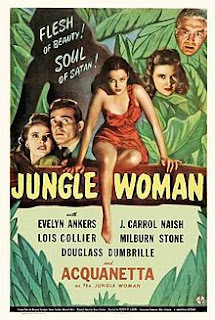 However, Jungle Woman (1944) re-activated the property, without reanimating it, into a dull and flimsy sequel. The contrast between the energy of the original movie and this boring sequel is evident especially because director Reginald le Borg cunningly fills up the first fifteen minutes by recycling more engaging chunks of Captive Wild Woman under the excuse of illustrative flashbacks. The reason is that we must explore what led to a sudden street attack upon an unidentified man by an unknown woman whom he fatally overpowers - shown only in silhouette. This inciting and briefly exciting incident then cuts to the inquest held into the murder of what will turn out to be the wild, captive Paula from that earlier film. On the hook for it is Dr Fletcher (J. Carrol Naish, whom we saw just a couple of month earlier operating with less moral restraint in The Monster Maker). He tortures himself with the memory of the killing and invites the panel to hear his case. The presiding Coroner is that reliably earnest model of probity Samuel S. Hinds. 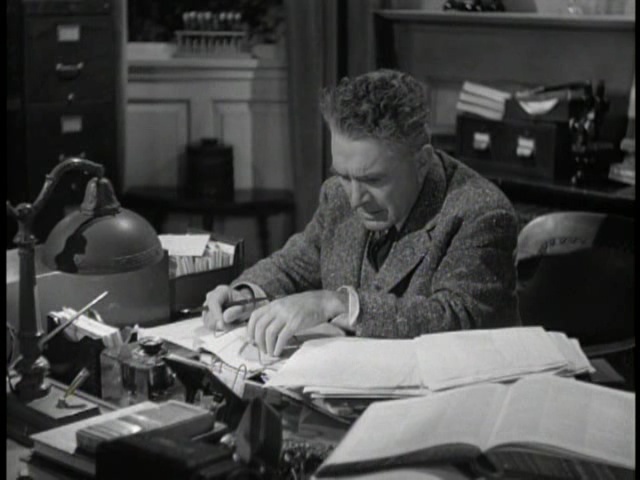 Representing the prosecution in a District Attorney cameo is Douglas Dumbrille, whose distinguished career included pompous stuffed-shirts ready for deflating by such comedy stars as the Marx Brothers in A Day at the Races (1937) and The Big Store (1941). Unfortunately they merely serve as under-used, high quality book-ends for the beginning and end of the film. 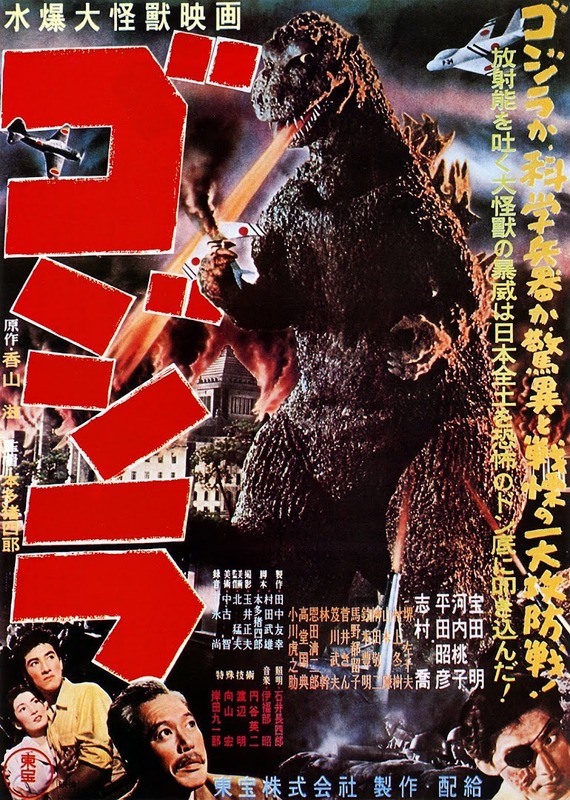 introduction of large chunks of the previous movie. Here our memories are refreshed by the rousing circus footage of real-life lion/tiger trainer Clyde Beatty and his big cats (see earlier review) doubling for Fred - which proved doubly cost-effective for Universal since it was now the second time Beatty’s scenes from 1933’s The Big Cage have featured in other films. There’s a fleeting glimpse of John Carradine’s evil Dr Sigmund Walters and then a reminder of Paula (Acquanetta) and her impressive supernatural remote-control of the wild animals that Fred trains. Ironically, as we shall see once again, Paula’s spooky influence may soothe the savage beast but she cannot discipline the primitive emotions seething within her. The remaining forty-five minutes of the sixty is mainly a turgid talk-fest set in motion by Dr Fletcher buying Walters’ Crestview Sanitorium that had been devoted to the questionably motivated study of “glandular disturbances”. Fletcher had also managed to save the life of the poor self-sacrificing ape Cheela who was shot presumably dead at the close of Captive after saving Fred’s life from the lions. 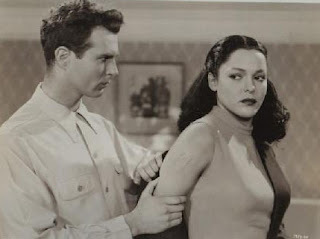 After the ape goes missing, Fletcher’s slow-witted henchman Willie (Eddie Hyans) comes back with a far more attractive bonus in the comely yet mute form of Acquanetta’s Paula. Readers of my earlier review will recall that her dark exotic beauty, dubbed disingenuously by the studio as ‘the Venezuelan Volcano’, disguised Acquanetta’s less captivating real identity of Mildred Davenport from Wyoming. It also offset to some extent the fact that she was a lousy actress. Acquanetta is able to manifest a brief glare of passion but anything with greater depth is beyond her. Sadly, whoever takes the role of Paula has to evince more raw bestial power than the virtually catatonic state she can gets away with when first taken into Fletcher’s care. (Her later outstretched-arm assault on Fletcher in his study is so unconvincing it looks like sleep-walking). Fletcher is unable to awaken Paula from her lack of talent, but then events take a turn when his daughter Joan (Lois Collier) and her handsome fiancé Bob (Richard David) turn up. Like Douglas Dumbrille, Collier played opposite the Marx Brothers and Abbott and Costello (twice - in The Naughty Nineties and A Night in Casablanca). There are no intentional laughs here though. Instead, man-eater Paula is so attracted to Bob that her silence is broken. “Hello, my name is Paula” she says, instantly at his side. Clearly, she is stimulated by something far more potent than clinical science can offer. Fletcher is overjoyed at the breakthrough; Joan, witnessing this sudden feminine magnetism, less so. Bemused Bob is flattered by Paula’s attention, yet happy in his proposed wedding plans with Joan. Paula has other ideas and when the two lovebirds take a canoe out on the river she dives in and, after killing Willie, secretly following, capsizes them. A jungle woman she may be, yet Paula is not so primitive that she doesn’t have access to classic manipulation techniques. She shows Bob some shoulder bruises under her dress that she claims were at Fletcher’s hands just as Joan walks in and clocks the potentially compromising tableau. Awkward timing abounds as Bob will also enter upon seeing Paula on the floor after her aforementioned zombified advance on Fletcher, thus temporarily supporting Paula’s conniving bid for Bob. While an unidentified Paula menaces Joan from the shadows in her room, other experts try to join the dots for Bob and Fletcher about this homicidally jealous semi-human in their midst. Till the very end we are spared the abysmal werewolf version of Paula that was on show in Captive Wild Woman, so it remains for fingerprint man Tom Keene to connect sets of found human and anthropoid prints as being a perfect match, and Pierre Watkin’s Dr Meredith to confirm Bob’s suspicion that Paula was the “someone with terrific strength” who sunk the lovers’ canoe ride. by him in the struggle. The D.A. thinks he has a clear conviction based on admission of guilt until the Coroner requests that they all view the body with him at the morgue. As the tray is slid out, the panel are shocked to see that Paula’s face has now reverted to an oddly masculine-looking werewolf. One look at this hairy exhibit and Dumbrille concedes “My apologies, Dr Fletcher”. A final faux-biblical quote sends us away with a warning that ‘The evil that man has wrought shall in the end destroy itself’. A far more apt warning would be ‘Buyer beware’. In trying to perpetuate a wild creature franchise from this material, Universal only made a monkey out of paying audiences. Jungle Woman did spawn another sequel, Jungle Captive (1945) which possibly wisely had no cast or director associations with the previous movies.